There but for the grace of my ten-speed and a bunch of hand-printed fliers go I. Jackson Lango's Canvasser tells the story of what it's like to be really invested in a cause and trying to get everyone on board with it. Through gameplay that's part strategy and part sim with just a dash of arcade action, you're tasked with helping a charity raise money to prevent a forest from being clear cut. But as anyone who's ever tried to do it will tell you, successful canvassing requires a bit more than waggling your brows and thrusting a donation tin at someone, and you'll need to be persistent, people-savvy, and even thick-skinned to survive meeting your goals each day... and your coworkers! Just click people to interact and make choices. Each day you're given a target donation amount, then sent to a different location to try to raise awareness... and funds! How much people are willing to donate depends on a lot of things, from their mood to the location, but most importantly, how much they care about the matter at hand, and how much they trust you. Those two factors can be raised by talking to them about different related topics, but be careful not to bore them or scare them off by asking for a lot of money. Equally important is your confidence, which increases not only by hitting certain milestones, but by performing well in interactions. Keep an eye out for power-ups that can randomly spawn during a stage, since nabbing one can temporarily give your stats a boost. Watch your time, though, since when the clock in the upper-right corner ticks down, you're done for the day, so be sure to move fast and talk to as many people as possible. When your confidence bar is filled, that's your time to strike, since people will be much more receptive to you! Just be careful, since if you fail to meet your goal three times in a row, you'll lose your job... though meeting your goal at least once resets the three strikes. Despite looking fairly simple, Canvasser has a bit of neat depth to it. Factors like the weather can influence how people react to you, and even the age of a person can determine how long they're willing to listen to you talk without getting bored. The game is, undeniably, more than a little repetitive, and not everyone likes scrambling within a time limit. Especially when you fall a single dollar short of your goal and are still treated like a failure. But on the other hand... Going out day after day, worrying about meeting deadlines and quotas, the frustration of getting brushed off or knowing who you're talking to isn't really listening to... by presenting all of this in an arcade game-like format, Canvasser gets its point across in an entertaining way without beating you over the head with it. Of course, whether that point still remains fun as a game is up to you. Sometimes funny, good looking, and definitely unique, Canvasser is worth a look... and just might make you think twice the next time you go to reflexively brush that person on the street corner with the clipboard off when they ask for a moment of your time. Has anyone actually become the top canvasser at least once? Interesting game but I was pressing choices as fast as I can before time ran out and hardly reading anything. I made plenty of mistakes by clicking on the wrong thing. It would have been nice if time froze while choosing and resuming when dialogue was taking place. I thought time did freeze during conversations... I'm pretty sure the time counter was just decreasing one per screen of dialogue. Although it did seem like the max-confidence bonus followed real time. Hmm the ending came sooner than I expected. I mean yeah we saved the forest, but I only got to be the top canvasser once - bloody Nolan kept beating me! I got top canvasser just now, isengrin. So it is possible, just really hard. Am I the only one who was confused by the ending? Nolan kept saying that he was going somewhere and was going to miss me. I had a conversation with him after one's day canvassing where he said that they were trying to fire him and kept giving him rubbish locations to canvas, but the next day he was top canvasser again. Was there a sub plot I missed while trying to save the forest? I didn't like the fact that the more you clicked, the faster your time ran out. So if I wanted to make more money, I had to waste time on fewer people and just *hope* that my confidence actually DID have an impact (which it clearly didn't). If I wanted to talk to more people, I had to use the fewest choices possible because every click ran down the clock and there were so many things that had to be done at the end of each session, you lost time really fast clicking through the paperwork and pleasantries. So what's the best strategy? Try to get closer to $100 from fewer people? I was always rejected at that dollar amount, so I quit using it. Try to get $5 from a ton of people immediately? That always kept me from making my quota. Is there a strategy that works, or is it just luck? On the positive side, the conversations with the other canvassers always made me laugh, because I know all of those people! I actually worked as a canvasser one summer in DC! 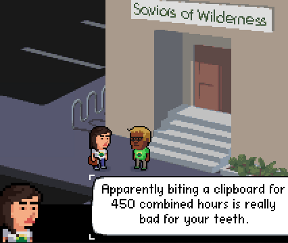 This game is very true to life, especially the part about being thick-skinned. Even though I was able to be the top canvasser in real life, I'm afraid I couldn't duplicate my results in this game. My only complaint is that this game should be harder. Hopefully that might discourage people from taking jobs based on harassing people on the street. I saved the evergreen forest. Almost got fired along the way though. I have to agree with fledeye. I think there's some sort of weird subplot I missed. When I finished the game, I was left with unanswered questions.